Yes, private sector admissions directors are stressed. With the start of the NACAC 2018 conference this week, arrival of the new Inside Higher Ed/Gallup survey of admissions directors was especially timely. Curiosity, of course, took me off to download a copy and read through the findings. With special attention to the results from admissions directors in the private sector. 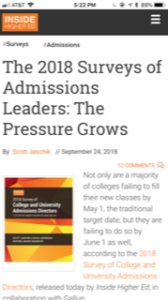 Inside Higher Ed on Twitter introduced the survey report with the not astounding note that admissions directors face “continued pressure… to enroll a class that meets goals.” Probably safe to predict that for most people at most colleges and universities that pressure isn’t going away anytime soon. In the private sector, it is more than likely going to increase. Here are the points I found most interesting in the 2018 results. Merit scholarships are alive and well in the private sector… and strong in the public sector as well. That’s despite the periodic stories about how colleges really should not be doing this and should focus instead on need-based aid. For many students, of course, a “merit” scholarship just meets a “need” for assistance. And sounds much better. Merit scholarship competition is not about to disappear. At private sector bachelors degree colleges, 73 percent of directors answered with a 4 or 5. At masters/doctoral privates, that’s a lower 52 percent. Is it safe to conclude that bachelor’s level colleges are more dependent on merit awards for enrollment success? Merit was also strong in the public sector… 67 percent at “doctoral” schools and 67 percent at “master’s/bachelor’s planned to increase “merit” recruitment efforts. That’s not going to help the privates. You have to think that admissions directors know that success in this area is a special challenge that might not be worth the effort. Is this inspired by the wishes of presidents and trustees? Just not enough proverbial “full pay” freshmen exist to win success at this many schools. And of the few who can afford “full pay” private sector tuition, even fewer will be “willing to pay” that amount. 43 percent at bachelor’s colleges in private sector will very likely try to increase this. 57 percent at master’s/bachelors in private sector are going to do the same. The difference within private sector schools flips the importance each group places on “merit” scholarships. International student recruitment might not be as prominent in this survey as in past ones, but the interest remains strong. Results show the caveat… international students at almost every college and university were once expected to pay full tuition. Increasing internationals was a contribution to increasing that unicorn goal of more full-pay students. But check the percent of admissions directors that believe maintaining international enrollment will require an increase in scholarhsip money. Life just isn’t getting easier. 52 percent at bachelor’s colleges very likely will increase recruitment here. 50 percent at doctoral/masters schools will do the same. 53 percent at bachelors colleges believe they need more scholarship money just to maintain current enrollment. 46 percent at doctoral/masters feel the same way. This is a real sticking point. A remarkably tiny number of admissions directors believe that either parents or students “understand the value of a liberal arts education.” Many “liberal arts” colleges continue to make that an integral part of their brand effort. 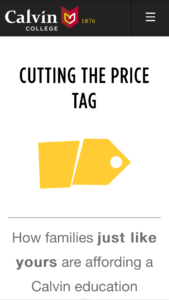 And thus we have a marketing dilemma, especially when cost concerns exist. My bewilderment here is how poorly most colleges and universities are at creating content that makes the loan debt level easy to find. When parents and students are so concerned about this element, why don’t more schools do what Calvin College has done to address the issue? Beats me. Hiding it doesn’t solve the problem. 96 percent at bachelor’s colleges: “Yes,” we lose students to loan debt fears. Public discussion of student debt has discouraged students from considering my college.